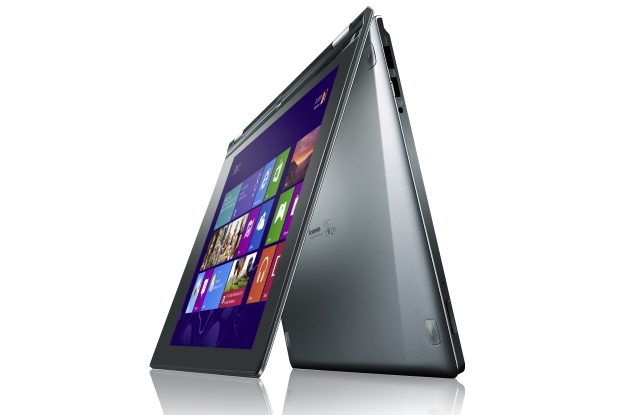 The Yoga 13 has a “box” shape to it, with curves on the side, the Lenovo logo on the bottom left corner. The Ultrabook measures 0.67 inches in thickness, with a nice smooth/sleek feel. The power button is on the front edge bottom on the left side, if you don’t look carefully you just might miss it. You also have the Novo button, it can be used to activate Lenovo’s OneKey Recovery system. On the left side you have an HDMI port, USB 3.0 port, audio jack, microphone, and volume controls. On the right edge of the Yoga 13, you have the screen rotation lock button, memory card slot, USB port, and the power jack. The bright beautiful 13.3 inch screen has a HD+ IPS LED display with a resolution of 1600 x 900. When you first turn on the Yoga 13 you are greeted by Windows 8 live tiles. Now remember the Ultrabook is also touch screen, while swiping through the live tiles you should have a cloth near by, after awhile the screen becomes consumed by finger prints and looks extremely dirty. The keyboard has a nice smooth and round feel, while the sides surrounding the keyboard has a rubber feel to it. The touchpad is pretty large, it features palm rejection so you won’t accidentally move the cursor while typing which is something I need. This touchpad also supports navigation actions such as, scrolling, zoom, and rotate functions. The web camera is located in the top center of the screen, the, on the bottom center of the screen is the Window button, if you are in the desktop mode pushing the Windows button will send you back to the screen where you have Widows live tiles, the button also is used to but the Yoga 13 in sleep mode. Yoga 13 comes with a 1.7GHz Core i5 processor, 4GB of memory, a 128GB SSD, and integrated graphics. When I turned on the Ultrabook I was thinking I had time to go get a drink, because as you all know when turning on a computer it takes a couple of minutes to boot up, well I was wrong, as soon as I pressed the power button withing seconds the desktop screen appeared. Lenovo’s Motion Control software uses the Yoga 13’s webcam to enable you to control the PC using gestures. You can swipe your hand to flip through photos, this also works with music allowing you rewind and fast forward. Motion control only works with selected applications which include: Windows Media Player, Windows Live Gallery, Picasa, Windows Photo Viewer, Adobe Reader, and Microsoft PowerPoint. Motion Control is a nice idea but, they were times when the software didn’t pick up my movements, which started to annoy me. Windows 8 is simple to use, if you have a windows 8 phone it’s pretty much the same set up. At first when I saw the live tiles I did think it was going to be a little to much, but actually they are quite usefully everything I needed to know was right in front of me. You can customize the live tiles, so I set up my tiles in the order of what I wanted to be up-to-date with (i.e. e-mail, weather, social networks, and Xbox). You have Internet Explorer and Bing as search engines, along with the Microsoft Store. On the desktop screen the only icon you will see is the recycling bin, now going through the Pre-Installed programs, you have a 90-day trial for Absolute Data Protect, McAfee, Lenovo EasyCamera, Lenovo Transition, Lenovo Cloud Storage by SugarSync, Microsoft Office 2010 (trial), Nitro Pro 7, along with others. The Windows 8 start-up screen includes a couple of Lenovo apps including Skype, AccuWeather.com, Kindle, eBay, Maps, and Evernote. You also have Games(Xbox), ebay and Music (Xbox Music). Now the reason it’s called the “Yoga” is because it can do what most Ultrabooks can’t do, which is bend into different potions. As soon as you bend the screen back into a tablet mode the screen will adjust on it’s own. I did feel a little uncomfortable holding the tablet in my hand for the simple fact the back is the keyboard, so while I’m holding it I’m also pressing keys, the good thing is while in tablet mode the keyboard isn’t in use, you relay only on the touch screen. I also tried using the keyboard as a stand and just relaying on the touch screen, which I liked a lot more. Is self explanatory the Yoga is filliped so the the keyboard is facing one way and the screen is facing another, I actually like “Tent Mode” for watching movies or playing games. According to Lenovo the Yoga 13 can last up to 8 hours. I did two different test, One with just surfing the web with multiply tabs open and the second is with me watching movies, playing games and surfing the web. With me having four tabs open, switching between desktop mode and playing with my live tiles I got almost 8 hours..Impressive, Now the next day I was playing Youtube videos, then watched a movie on Netflix for about an hour and a half, played a game called Monster Island and surfed the web. I was able to get 6 1/2 hours then had to charge the Ultrabook. 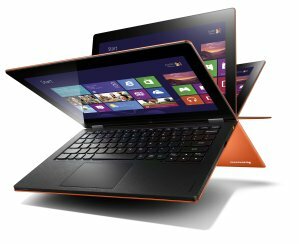 Lenovo’s IdeaPad Yoga 13 is a powerful system and definitely eye catching. Touch screen is responsive, no lag when swiping through screens and boot up times is extremely fast . Being able to switch between my “Desktop Mode” and “Windows 8 Live Tile” makes me feel like I have more options and getting my moneys worth. Overall For $1100 it’s slim, feels great, has great battery life, I was shocked on how loud the speakers are. This is one Ultrabook everyone can use.